If you’re anything like me, you are constantly on the lookout for collections to gobble up. Your ears perk up when people talk about getting out of the game, you browse Craigslist for people offloading their kid’s old box of cards, and upon hearing someone comment that they used to play you immediately begin an inquisition into the whereabouts and age range of their cards. The end result of this is that you end up purchasing collection after collection. You strip it for the rares and foils then shove the boxes into a corner. Pretty soon, you have thousands, if not tens of thousands, of lands/commons/uncommons with which you don’t know what to do. Before I listed it I did one final pass. I wasn’t looking for rares though; rather, I was looking for commons and uncommons. You see, the first time(s) through I was mainly looking for rares and money uncommons such as Lightning Helix or Kitchen Finks. The Zendikar box that had Explores, Expedition Maps, and Goblin Bushwhackers? I had skipped all that stuff. I left in the 30 or 40 Lightning Bolts and the multitude of Brainstorms that had accumulated through various eras. This time I pulled out any common or uncommon that looked remotely playable. By the time I got all the way back through I must have pulled a solid 5,000 cards out, completely and utterly unsorted. I began plugging cards into MTGPrice to check their buylist value. Anything worth $.10 or more was kept, and the rest tossed back into the box. The work wasn’t all that bad really. I put on some ST:TNG and plowed through. Once I knew that the uncommon shard lands from SOA were worth more than ten cents, I didn’t have to look them up every time. Same with all the rest of the cards that kept repeating. After the first 1,000 cards or so, there weren’t too many repeats. At the end of this process I had somewhere between 2,500 and 3,000 commons that were all worth at least $.10, and much of it worth more. The problem at this point was that it was still totally and completely unsorted, as there were easily over 100 unique cards in the stack. Furthermore, even if I did sort it, buylisting a pile of that size is sort of a nightmare. Sure HotSauce gives $.45 on Crumbling Necropolis, but what if they don’t want twenty of them? What if they only want twelve? Well now I have to see who pays the next highest amount and sell some to them. What if they don’t want all the ones I have left either? Onto a third store. You can see how this could get tedious, especially taking into consideration that unless I did every order in a single day, the buylist requirements could change as I worked through the pile. Then I’d have to ship everything, make sure they gave me how much they were supposed to, and so on and so on. On top of that, had I gone through all of this, I surely would have ended up with some amount of cards left for various reasons. So I procrastinated. I let the cards sit there in my room for a few months. Eventually an SCG open rolled through town and I figured I’d bring them with me to see what I could get for them. I wasn’t holding my breath but I thought it was at least worth my time to find out. After taking my third loss in Standard on Saturday, I grabbed the boxes from my car and plopped them on the buyer’s mat. I was expecting him to groan and slowly begin ctrl+f’ing the SCG buylist, sorting the cards into various $.10 and $.50 piles. He opened one of the boxes, flipped through a bit, and told me he didn’t feel like looking all of it up. After a quick scan of the other two 1,000 count boxes he made me a simple offer: $.25 per card. At the end, I pocketed $650 cash for a few thousand commons and uncommons in the span of fifteen minutes. I’m well aware that I probably could have eeked out a bit more money had I buylisted the entire pile myself, submitting five or ten buylist orders to various websites. Maybe I could have even got an extra $100 out of it. But think about it like this – all of that would have taken time and effort. A considerable amount of it, in fact. I’d wager that I would have spent at least four hours organizing all of those buylists, if not more. If you consider that I lost $100 shipping the entire pile at $.25/ea instead of buylisting it individually, and it would have taken at least four hours to do, I paid myself at most $25 an hour. I am completely happy to make that exchange. The reason I present all of this to you is to illustrate two things. The first is that all those decent commons and uncommons that aren’t quite worth lugging around in your trade binder are still completely worth pulling out of collections. The only thing you should be leaving behind are the bulkiest bulk C/UCs. (Of which, to be fair, will comprise a majority of the collection). Make sure you’re still pulling each and every rare too! This same weekend a pair of friends had accumulated bulk rares over the last few months from buying binders from people, and ended up getting a crispy mint pair of Revised Underground Seas for them. (I personally have been keeping all my bulk rares. They’re never going to be worth less than $.10, so I’m not losing money holding onto them, and every now and then when a card spikes to $5-$15 I get to dig through the box and pull a few copies out. Disrupting Shoal, Fist of Suns, Genesis Wave, etc). Perhaps more importantly, it’s worth it to appropriately value your time. The amount of effort it would have taken to wring a few extra bucks out of all of that would have doubled, tripled, or even quadrupled the amount of time I had put into it. Screw that. Recognize that your time has value and that it’s perfectly acceptable to forfeit some amount of capital in exchange for your entire Saturday back. Whenever you’re thinking about investing a large amount of time into an activity whose sole purpose is to make you money, consider how much you’re making per hour. When it comes to things like sorting bulk commons, chances are it would be more lucrative to simply work a side job on the weekend. I’ve started trading my extra Liliana of the Veils. Her price has been fairly stable since early this year so I’m not expecting any big movements out of her in the near future. She may gain $10, but I don’t think we’ll see her climb above $80 or $90 TCG anytime soon. There are two reasons I’m looking to trade her right now. The first is that there were comments that she was initially in the file for M15. She was pulled for power level reasons (duh) but it shows that Wizards is looking to get her back into our hands. I don’t think we’ll see a reprint in Khans, but with MM2 looking so likely, and that being a perfect place for her, I’ve decided to start shopping her around. I’m not advocating any fire sales, but I’m happy to take Theros staples for her right now that are guaranteed gainers in the next few months. People continue to clamor about fetches in Khans. Real quick, what I feel is one of the best reasons we won’t see them: Fetches came around last time with landfall. Both were wildly popular. Wizards wants to bring back both. Because of the five-tribe nature of Khans it can’t support landfall as a major mechanic. Since landfall wouldn’t fit well in Khans, they’ll hold it (and fetches) for a set that will better support both. 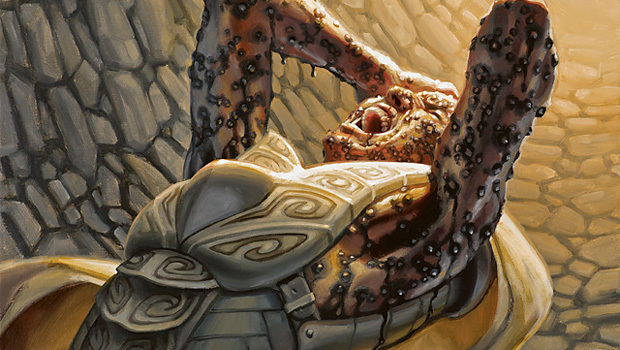 Eidolon of the Great Revel wrecked my face in Legacy this weekend. Burn decks have always been tier 1.5 to tier 3 budget decks in Modern and Legacy. Eidolon is a big bump in power for them in both formats. Foils are around $20-$25 right now. At those numbers I’m happy to trade for them. I could see them at $30-$40 within a year. Nissa, Worldwaker is the truth. She’s hanging strong at $30+. I expect she’ll dip, but I also think it’s unlikely we see her below $20 before the end of the calendar year. If you want a set, go ahead and trade for her. I will be. Finally, this isn’t necessarily finance related, but I have a platform so I’m going to use it dangit. Wouldn’t Leyline of Anticipation be great in those Modern discard-heavy decks people are always trying to make? Think 4x Thoughtseize 4x Inquisition type decks. They can frequently tear the game apart in the first three turns but often lose to a Tarmogoyf or Bob off the top of the deck while some one-mana discard spell rots in their hand. With Leyline in play, you can cast those discard spells at the end of their draw step just like you would Clique. Leyline turns all those awful late-game Thoughtseizes into much more potent spells, as you can actually nab anything they draw before they cast it. Those decks often run Liliana or Smallpox or something similar, and are constantly discarding their own stuff, so pitching redundant Leylines would be fine. Drawing a late Leyline when you already have one in play is obviously bad, but now instead of having eight to twelve dead top decks in the form of Thoughtseize and Duress, those are all live and only the three other Leylines are dead. That seems like a solid trade. I doubt this makes those decks tier 1 contenders or anything, but it just struck me as an unusual card choice that could actually do a lot to shore up the problems those types of lists tend to have. Another aspect why Wizard will not reprint the Fetchlands in the Fall Set this year. There has been a lot of complaining about the entering price of Modern, to solve this wizard wanted to avoid the modern season of the next year and the reason is because they will not reprint the fetchlands, so people would get upset without being able to play Modern with a good manabase. So they tried to avoid this, keeping the next year with full standard. The problem is they hyped so much modern that now there is no coming back and people complaint “a lot”. Actually I was thinking of this as a possibility to pick up some modern staples cheap, but well that won’t happen. With commons and uncommons what about sets of 4? If while sorting your cards you managed to make 3 or 4 complete playsets of every common in M15 or Theros is it better to sell these now or throw them in a zip lock bag and keep them in a box for 5 years. On one hand there are new players getting into standard on the other people will be making set cubes in the future and common uncommon sets of old sets aren’t easy to find. Nearly all commons and uncommons drop in price after they rotate out of Standard. Holding onto them for years in the case that they gain another $.50 or something isn’t a viable strategy. I can hit up TCGPlayer right now and purchase complete C/UC sets across a handful of vendors if I see fit, and I don’t have to pay much of a premium for it at all. Nissa is awesome. You are so right. She combos so well with forests. Funny thing about forests, there are 5 different ones in Standard. You have Temple Garden, Breeding Pool, Overgrown Tomb, Stomping Ground, and Forest. If I was going to buy into Nissa, I would consider her playability in a Standard format that features a wedge set and only basic forest. She is better now than she ever will be again. Great article, I never thought vendors would even consider boxes of old junk cards.. I dont know whether I should bring in my old cards or ask first at a PTQ then bring it next time.. I have quite a few that I may move, they aren’t even worth adding to my online collection of various trading websites. Most modern staples are dropped in price, now would be a good time to work on modern while nobody is playing. Also on Nissa, Zach is right. Personally I have created a Green devotion splash black deck for rotation. I have two copies of Garruk, Apex.. However sitting at 8 total forests, I dont think Nissa is worth the slot yet. I will playtest, because her land activation is far superior to her mana untap… The format was supposed to slow down/power creep, what were they thinking when they gave you a free 4/4 trample every turn!